MAC mobile phone data recovery software recovers lost cell phone saved precious digital pictures, images and phone numbers along with their specific contact name. Cell phone data restoration application for Apple Macintosh OS X retrieves your deleted inbuilt mobile phone saved data with minimal efforts. Restore accidentally deleted photographs, photos and snapshots from corrupted memory card of your cell phone in less time. Recover lost mobile phone saved data like mp3/mp4 song, audio, video clipping etc in only few easy mouse clicks. Regain missing or misplaced memorable pictures, snapshots and other precious data from your mobile phone at reasonable price. ❶ Recover lost entire cell phone saved data without any data loss : MAC mobile phone data retrieval software restores your lost important phone memory saved data without any data loss. 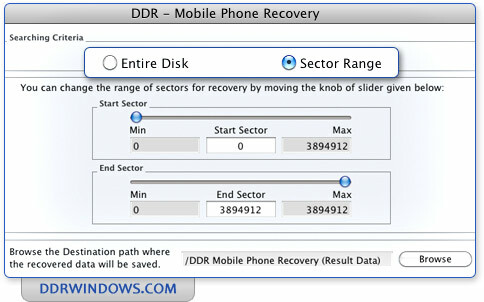 ❷ Provides advanced inbuilt disk scanning techniques : Cell phone data recovery program for MAC offers advanced inbuilt disk scanning mechanism to search and restore lost mobile phone data. ❸ Regain lost files of all extensions : MAC mobile phone data restoration tool recovers lost files which are saved in any types of file formats regardless of their extensions. ❹ Provides preview facility : Macintosh cellular phone data salvage software provides facility to view your entire recovered cell phone saved data before their actual recovery. ❺ Offer interactive GUI interface : Apple Macintosh OS X mobile phone data rescue utility provides highly interactive GUI feature with inbuilt manual help.